Wired is celebrating the 40th birthday of laptop computing a bit prematurely. Problem is, in 1968 portable computing was only an idea. The first portable computer didn't come to market until 1981, the first notebook until 1982, and it's only in the past couple of years that netbooks have come anywhere close to the 2 pound weight that Alan Kay envisioned 40 years ago. The concept of the handheld portable computer goes back to Alan Kay's days at Xerox PARC. In 1968, when computers were massive and lived in clean rooms, he envisioned the Dynabook, a handheld computer weighing less than two pounds. Kay's concept was a computer about 9" x 12" x 3/4" with a fixed keyboard, so it was neither a tablet PC nor a notebook. To my knowledge, nothing like it has ever been brought to market - at least not anywhere close to size Kay expected. The Dynabook would have a stylus so the user could interact with the display, which would have at least 1 million pixels. Today's devices that most resemble the Dynabook are smartphones, which you have to admit bear an uncanny resemblance despite the difference in scale. The first portable computers was the Osborne 1, a CP/M computer with a 4 MHz Z-80 CPU introduced in April 1981 with 64 KB or RAM, two 92 KB floppy drives, and a 5" screen that displayed 24 lines of text with 52 characters per line. Adam Osborne's brainchild sold for US$1,795 with a collection of bundled software (SuperCalc, WordStar, Microsoft MBASIC, and Digital CBASIC), was the size of a small suitcase, and weighed 24 pounds (50% more than the original Macintosh!). The Osborne 1 was designed to run from 120V 60 Hz AC power, but a third-party one-hour battery pack was available. The spaces below the floppy drives allowed you to store your single-sided, single-density 5-1/4" disks and take them anywhere you brought the computer. An optional circuit board added double-density support for 92 KB and 182 KB Osborne, 82 KB Xerox 820, 80 KB Cromemco, 171 KB DEC VT-180, and 156 KB IBM PC CP/M-86 formatted floppies. An optional 300 baud modem fit in the left bay. The computer was an overnight success, with sales reaching 10,000 units per month. The Osborne 1 enclosure was redesigned with a cleaner, more rugged design and support for 220-240V and 50 Hz or 60 Hz power. Osborne updated the design with the release of the US$2,495 Executive in 1982. The biggest difference was a 7" amber display capable of displaying 80 character lines of text, which increased the computer's weight to nearly 29 pounds. Responding to Osborne's success, Non-Linear Systems began designing a similar computer in 1981. Kaypro Corporation was formed to sell the new computer, the Kaypro II. Specs were virtually identical to the Osborne, but the Kaypro had a 2.5 MHz CPU, a no nonsense aluminum case, and a 9" display - a huge advantage over Osborne's offerings. Two 191 KB double-density floppy drives were standard, and it had a similar software bundle. The later Kaypro IV had two double-sided drives, and the Kaypro 10 was the first model with a hard drive. both were introduced in 1983, and in 1984 the Kaypro 4 was introduced with a 4 MHz CPU. One feature beloved by Kaypro users was the ability to read a multitude of disk formats, which made the Kaypro compatible with most 5-1/4" CP/M disks regardless of what brand of computer they were created on. CP/M had been the first general operating system for personal computers, much as MS-DOS and Windows were later on. And that was the problem - IBM introduced its PC in August 1981. That was the beginning of the end for CP/M. IBM was unsure of the personal computing market, so it designed its computer using off-the-shelf parts - and avoided the expense of developing an operating system by licensing three different ones. CP/M-86 from Digital Research was widely expected to be the norm, the UCSD p-system was for geeks, and PC-DOS from Microsoft was considered the dark horse. Ever savvy, Microsoft had not licensed DOS exclusively to IBM, so when other companies designed alternative hardware, they could sell it with the same operating system as the IBM PC. The first IBM compatible was introduced by Compaq Computer Corporation in November 1982. Unlike the desktop IBM PC, the Compaq Portable was portable, following the design path blazed by Osborne. At US$3,590, it was over twice the cost of the Osborne and Kaypro offerings, but it ran the same OS and apps as the IBM PC. The Compaq Portable had a unique feature: The graphics card and internal display could do either high resolution text (640 x 350 pixels) or CGA graphics (640 or 320 by 200 pixels). From this start, Compaq bridged out to desktop computing, lunchbox portables, servers, and notebook computers, eventually merging with Hewlett Packard. IBM tried to compete with Compaq with the IBM Portable PC. Released 13 months after the Compaq, it only supported CGA graphics and fizzled. The Grid Compass is widely considered to be the first notebook computer. Introduced in April 1982, it introduced the clamshell design, ran a proprietary operating system, had a 320 x 200 display, used bubble memory for storage, weighed 11 pounds, and sold for over US$8,000. A year later this was joined by two competing notebooks, the Gavilan SC and Sharp PC-5000. The Gavilan was half the price of the Grid and ran MS-DOS, although it was not fully compatible with the IBM PC. The Sharp was more IBM compatible and, like the Grid, used bubble memory for data storage. Neither of these notebook computers had a full sized display. The Epson HX-20 introduced a different kind of field computer when it was announced in November 1981, although it was not widely sold until 1983. It had a full-sized keyboard and a similar form factor to the TRS-80 Model 100 (below). It used rechargeable NiCad batteries and has a built-in thermal printer. Its display only had room for 4 lines of 20 characters, and an optional microcassette could be used to store files. Unfortunately the HX-20 was slow in coming to market, which gave Kyocera the opportunity to design something different and, in many ways, better. Tandy, the parent company of Radio Shack, introduced its own version of the Kyocera Kyotronic 85 in 1983 (it was also repackaged and sold by Olivetti and NEC). The TRS-80 Model 100 was a journalist's dream, a portable word processor that was easy to use anywhere and affordable (US$499). The Model 100 had a full sized keyboard with a much more useful 8 line, 40 character display, a built-in word processing program, Microsoft BASIC, and a 300 baud modem. It turned on instantly, ran for 20 hours on AA alkalines, and the telecommunication software made it relatively easy to send word processing files to other computers. PC World names it one of the 25 greatest PCs of all time and one of the 10 most important laptops. Although IBM wasn't the first with a portable PC compatible, the IBM PC Convertible was one of the first PC compatible notebooks. Introduced on April 3, 1986, it was IBM's first personal computer with a 3.5" floppy drive. It weighed 13 pounds and had a CGA (640 x 200) display, which was compressed vertically - find for text, but graphics were misshapen. The PC Convertible had room for an internal modem, but no room for a hard drive. It included a suspend mode that put the computer to sleep rather than shutting it down all the way to avoid the long, slow, floppy-based boot process. The PC Convertible was a failure on the market because it was big, heavy, and didn't include standard PC ports - serial and parallel ports could be added via modules that docked to the rear of the computer, making it even more unwieldy. One such module put a printer on the back of the computer. The Toshiba T1000, introduced later in 1986, made Toshiba an early leader in the notebook field. Unlike the PC Convertible, it had serial and parallel ports built into the computer, supported a nonvolatile RAM disk, and ran MS-DOS 2.11 from ROM. At 6.4 pounds, it was half the weight of IBM's beast. The only drawback it had relative to the PC Convertible was a single floppy drive. Early notebooks had much larger footprints, CGA displays, and relatively slow CPUs. The first notebook with a VGA (640 x 480) display was the Compaq SLT/286 introduced in 1988. It had a 12 MHz 80C286 CPU, a 20 MB hard drive, and was just 8.5" deep, making it suitable for use on an airline tray. The keyboard could be removed for desktop use. On the downside, the SLT/286 was very thick (I can't find dimensions anywhere), and it weighed 14 pounds. Compaq took another step forward (and one step back) with it LTE family of laptops in 1989, which were much slimmer (again, I can't find dimensions) and lighter (6.7 pounds) than the SLT - but gave up VGA graphics for CGA. I remember these being very popular with Mac users, as Apple had no portable at the time. That changed in September 1989 with the introduction of the Macintosh Portable, which has been widely maligned for being big, heavy, and expensive. The thing is, it wasn't "big, heavy, and expensive" in comparison to other top-end notebooks, although compared to the Toshibas, Compaq's SLTs, and the NEC UltraLight, it seemed so. Unlike the competition, the Portable had a 640 x 400 active matrix display, a 10 hour battery, a trackball, and it ran the Mac OS. It also ran at 16 MHz in an era when most high-end DOS notebooks were using 12 MHz 286 CPUs. The first Macintosh without a built-in floppy drive wasn't the 1998 iMac; it was the PowerBook 100, introduced in October 1991. Apple hired Sony to shrink the Mac Portable, and they got it down to 5.1 pounds and an 8.5" by 11" footprint in part by making the floppy drive an accessory. 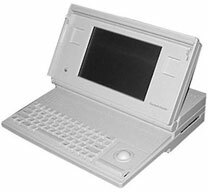 Mac users finally had a portable as compact as the Compaq SLT 286, although more people opted for the larger, more powerful, and more costly PowerBook 140 and 170. These models introduced the trackball-forward design that has defined most notebooks designed since then, although the PC industry still experimented with other locations and types of pointing devices. The first notebook to support 256 colors was the PowerBook 165c (Feb. 1993), and the PowerBook 500 family (May 1994) were the first notebooks with a trackpad, built-in ethernet, stereo speakers, 16-bit stereo audio, an expansion bay, and automatic sleep when closing the lid. 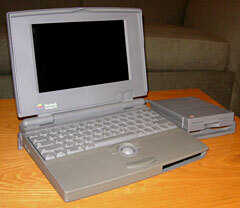 The titanium PowerBook G4 (Jan. 2001) was the first 1" thin notebook and introduced widescreen displays. More recently, the MacBook Air showed how thin and light Apple could make a notebook without shrinking the keyboard or display. It also introduced the unibody construction that is now used on the newest MacBook and MacBook Pro models. Notebook computers range in size from 7" netbooks to 18" behemoths, desktop replacements in almost every sense of the word. The hottest range today is netbooks, which have 12" and smaller screens, energy sipping CPUs that don't run anywhere close to bleeding edge speed, and are designed to work well with the wireless Internet and sell for as little as possible. I see that segment growing, and I hope Apple will enter that market within the coming year. Of course, Apple could come at it from a completely different direction - a scaled up iPod touch instead of a scaled down MacBook is one possibility. Another would be a new product, neither iPod nor MacBook, that's more like a scaled-down Dynabook with a flat design, a real keyboard, and a touchscreen.